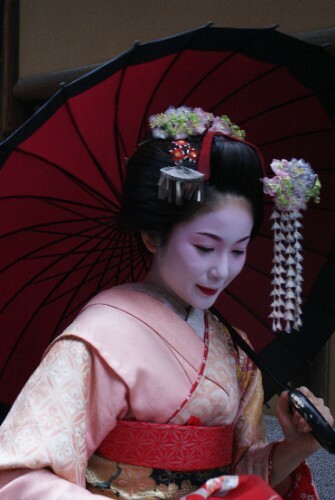 Blog from Kyoto, Japan | Where is the Love? We arrived at Tokyo airport at 6.30am.As usual Brian was tired and grumpy when we landed as he is too scared of flying to get any sleep on the plane.Admittedly it was the mostturbulent flight we have so far.The plane did drop from the sky at one point as we caught the tail end of a typhoon off the coast of Japan! Thankfully for the frugal Loves, Andy had told us to buy a Japan rail pass before we got to Japan.This saved us a fortune in rail costs over the week.We decided to have a bit longer in Japan so that we could meet up with Brian's uni flat mate (Stewart) in Hong Kong after his holidays.This turned out to be great as Japan was totally amazing.We loved everything about it.The cleanliness, friendly people not out to scam you, the efficient travel, nice hostels! On day 1 we got our rail pass.Luckily the girl spoke English and told us how to get our first train.Feeling like total train spotter geeks we were impressed by the bullet trains (Shinkansen) and even had to take some photos on the platform.All trains in Japan run on time to the second- you can set your watch by them.A welcome break from the travel in South East Asia.We boarded the train and were off to Kyoto feeling the g-force! In a smooth couple of hours we arrived in Kyoto. A lot of the signs are in English which made our trip pretty easy.Our first issue was trying to find an ATM that would give us some money.Organised as ever we had arrived in another new country without any local currency.Eventually we found the post office full of westerners and got our first Yen. We stayed at K's House in Kyoto which was a great hostel.Almost 5 star luxury compared to what we had been used to sleeping in.It was pretty wet but obviously there was a whole new city to see so we couldn't hang around. We learned that the Japanese in Kyoto are very good at cycling one-handed holding an umbrella in the rain.They also haven't heard of cycling on the roas so you have to watch your back! We were hungry so attempted to find some food.Being in Japan we thought we should try some Udon noodles.Looking suitably confused in the noodle café the chef produced an English menu.We ordered our Udon and soup and slurped away with the locals. We were too late to get in to the Castle so wandered about in the rain much to Brian's frustration.It was starting to get dark so we headed for Pontocho which has lots of little tea houses and lanterns and is famous for Geisha.Sadly we didn't spot any Geisha this time and headed back to the hostel for a comfy night's sleep. On day 2 it was still raining.Given that I only have 1 pair of trainers and lots of flip flops I had to walk about with plastic bags in my shoes.Given we were in Japan we had to take our shoes off everytime we entered a temple, shop or restaurant!The rustling of the plastic bags was met by a few enquiring looks from the Japanese. We spent the day exploring southern Higashiyama which was full of beautiful temples. Just the sort you imagine when you think of Japan.We drank lots of holy water and saw a few couples out in their Kimonos.The definite highlight of the day was our Geisha-spotting.We were wandering down a picturesque lane with lots of little wooden houses when in front of us two Geisha girls came out of a house.They were stunning.It was only us and them so I asked if I could please take some photos rather than be like the paparazzi snapping in their faces.Such an amazing and pretty rare sight. The next morning we got the local train out to Arishyama where we had breakfast in a local coffee shop. The man behind the counter had a bow-tie on and was making coffee in what looked like a science experiment with a bunsen burner and glass tubes. Very tasty toast and jam with the locals though. We then wandered about some more stunning temples including Tenryuji and walked through a bamboo forest which was pretty amazing. We then rushed back to Kyoto central and jumped on the bullet train to Hiroshima to find out about the horrific atomic bombing. Souradwip I had looked at that blog and, now I check, that was where I had the link from. Unfortunately, rniyleg as I do on the Google translator, I get quite confused as a result.It seems to me that the fan was a fairly creative idea in itself. Like many though, unless everyone can develop and apply the idea, the competitive advantage becomes to great to overcome. Sefine , that is not always a bad thing. When I was a boy, my fatehr owned two handguns, and it never occurred to me to pick one up. If I wanted to shoot, I asked my fatehr and we went shooting. But those guns were my fatehr's, they could hurt people, and they didn't belong to me. When I was very small they were out of reach, of course. When I was older, my fatehr taught me how to use them safely.We live in a very different society now. The only reason I suggest mandatory sentencing for crimes committed with firearms is that the stigma of committing crimes with firearms seems to be quite low nowadays. An ethical framework begins at home, but not very many parents seem concerned with that at present...though I am finding more and more parents who do care about more than their salary or the newest fancy car to drive. Some of the poorest parents (in terms of money) are among the best of parents (in terms of parenting), if you will excuse the world play.I could be wrong, of course. Most posters to websites don't admit to that kind of possibility, but I do. Yet the facts remain. It is certainly true that crimes committed using firearms have increased greatly in number. I am happy to hear other, better solutions. "Bobh" makes a great point, and it illustrates why my Libertarian friends don't seem to respect me much. On the one hand, I think it is strange that we require testing and licensure for drivers---along with mandatory insurance in the several states in which I have lived---but not for firearms. On the other hand, there is no mention of automobiles in the Constitution. I am reminded of the old science-fiction story where the motto goes: "The right to buy find weapons is the right to be free. "But we don't live in that world, sadly. I am willing to compromise a bit. To me, it all comes down to personal responsibility. If I carry a firearm, I am 100% responsible for it. But most governmental entities do not agree. So they try to institute controls. I am trying to find a compromise (according to Ambrose Bierce, that is defined by a solution which angers everyone).I don't mean to trivialize the firearm issue, but I do tend to see it in light of the automobile issue. It costs money to get "drivers' education," to take the test, and to get the license. Ditto the insurance required most places. Does that discriminate against the poor? How about older people who lose the ability to drive safely. Yup. But notice that most places have "workarounds" for that in many cases.But "Bobh" makes good points. Playing Devil's advocate, I would say that drivers' licensure is not the same as firearm licensure due to safety issues of the license holder, and their ability to protect themselves.Yet, as Larry Niven once wrote: freedom multiplied by security equals a constant. The more freedom, the less security. The more security, the less freedom.Again, just my thoughts and I appreciate the responses. "Eric Blair"
Pooja Hello Web Admin, I noctied that your On-Page SEO is not that great, for one you do not use all three H tags in your post, also I noctie that you are not using bold or italics properly in your SEO optimization. On-Page SEO means more now than ever since the new Google update: Panda. No longer are backlinks and simply pinging or sending out a RSS feed the key to getting Google PageRank or Alexa Rankings, You now NEED On-Page SEO. So what is good On-Page SEO?First your keyword must appear in the title.Then it must appear in the URL.You have to optimize your keyword and make sure that it has a nice keyword density of 3-5% in your article with relevant LSI (Latent Semantic Indexing). Then you should spread all H1,H2,H3 tags in your article.Your Keyword should appear in your first paragraph and in the last sentence of the page. You should have relevant usage of Bold and italics of your keyword.There should be one internal link to a page on your blog and you should have one image with an alt tag that has your keyword .wait there's even more Now what if i told you there was a simple WordPress plugin that does all the On-Page SEO, and automatically for you? That's right AUTOMATICALLY, just watch this 4minute video for more information at.